So what is CAP Fresh Start? It's a warm and welcoming environment where people listen to other people who may have similar struggles and share experiences if they want to. It's for people of all ages who want to give up a habit or overcome a dependency. The group form a community who meet weekly for support, food and fellowship. During the Fresh Start Group, there is an 8 week course that enables individuals to tackle some of the root issues that may be causing dependency so that they can live a happier, more fulfilling life. The course based on the 12 steps of recovery and each session works through these steps alongside exercises. Also informal one-to-one coaching is available from dedicated coaches who will listen and encourage people on their journey to freedom. So if you know of anyone who would benefit from joining this group, whatever type of addiction they have, please ask them to ring us 07380387615. 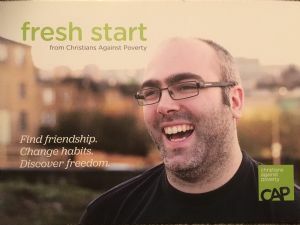 Also if you want to know more about CAP Fresh Start Groups we are happy to come and deliver a short talk to your church. Or if you are interested in getting involved as a volunteer please ring on the above number. Please continue to pray for the Circuit CAP Fresh Start Service, all group members, the team of volunteers, donation to fund the food and for individuals who are in need of this service to find their way to this group.